People do imbecilic things when alcohol enters the mix. It is a fact of life. On one end of the spectrum, drunkenness promotes relatively harmless buffoonery, whether it is singing along to “Sweet Caroline” completely out of tune at the bars on Water Street or repeatedly professing one’s love for his or her friends and family. Sometimes, the passions of the moment, coupled with inhibitions lowered, push one to act out ill-conceived ideas that the voice of reason would have prevented, such as drunk-dialing. On the other end of the spectrum, a beer- and liquor-swilling patron’s conduct may cross the line into the unlawful. As the story develops, the burning of a statue of President Obama in West Allis may be in the company of the latter behavior. 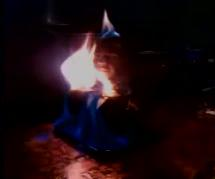 TMJ4 reported that at the Yester Year’s bar, patrons lit a bust of Obama on fire. The video footage was blurry given the room’s darkness and only focused on the statue placed on the bar, though “hoots and hollers” can be heard in the background. Though West Allis is investigating whether the burning violated the city’s municipal fire code, the Milwaukee District Attorney’s Office will not charge anyone involved in this incident, and the Secret Service has terminated its own investigation. This incident may very well not prompt legal action beyond those for possible fire code violations. One cannot help but wonder, however, if the First Amendment would provide protection for burning an Obama effigy. After all, burning effigies have become a staple of political protest, and political speech has generally been given the greatest amount of First Amendment protection. However, burning things, such as flags, Texas v. Johnson, 491 U.S. 397 (1989), and Selective Service registration certificates, United States v. O’Brien, 391 U.S. 367 (1968), constitute what the courts have treated as “symbolic speech,” and that speech has been given less protection than the paradigmatic form of speech, the use of language. Moreover, that is not to say that any act of setting something on fire amounts to speech protected by the First Amendment. To the contrary, in order to qualify for First Amendment protection, the speech must be “sufficiently imbued with elements of communication.” Spence v. Washington, 418 U.S. 405, 409 (1974). Though burning effigies in the context of political protests usually are done with a communicative purpose, one would be strained to find such a purpose here. In fact, the owner of the bar has tried to disclaim substantive reasons for the burning, such as racial prejudice, instead claiming that it only resulted from a few too many drinks. Though the background context is missing from the news reports and the video, there is no indication that starting this bust of Obama on fire was done with an intent to convey any particular kind of message. Without being able to figure out whether there was a message in the first place and what the content of the message was, it becomes even more difficult to determine that there is a great “likelihood . . . that the message would be understood by those who viewed it,” as is also required for symbolic speech to be subject to First Amendment protection. Spence, 418 U.S. at 410-11. Even if the statue’s burning fell within the ambit of the First Amendment, West Allis taking action for the fire code violations would probably pass constitutional muster. With the lesser protections afforded symbolic speech, “sufficiently important governmental interest in regulating the nonspeech element can justify incidental limitations on First Amendment freedoms.” O’Brien, 391 U.S. at 376. Thus, the Court has “limited the applicability of O’Brien‘s relatively lenient standard to those cases in which ‘the governmental interest is unrelated to the suppression of free speech. '” Johnson, 491 U.S. at 407 (quoting O’Brien, 391 U.S. at 377). A Supreme Court of Ohio case, Bellecourt v. City of Cleveland, 820 N.E.2d 309 (2004), involving a protest where effigies of the Cleveland Indians’ mascot were set ablaze, is particularly on point. There, the court noted that efforts by police officers in that case were not directed at censoring the speech; instead, they were acting out of concern for the public safety posed by smoldering effigies. Similarly, violations of a fire code imperil those inside the building, especially where the occupants are inebriated enough to start an uncontrolled fire in the first place. If the effigy was knocked over by a disoriented patron, an even bigger flame could have engulfed the bar. Furthermore, there is no indication here that West Allis’s pursuit of these violations is a pretext for what amounts to a political disagreement with whatever speech can be found in the Obama effigy burning. Though the First Amendment has been known to protect a broad swath of questionable speech and conduct, it does not provide any shelter here.